Bertie Carvel & Richard Coyle in the London production of "Ink"
On the heels of a celebrated run in London's West End, James Graham's Olivier-nominated play Ink, which follows the birth of England's most influential newspaper, will transfer to Broadway in 2019. Tony nominee and Olivier winner Rupert Goold will reprise his duties as director for the play's Broadway run, slated to begin on April 2 with an opening scheduled for April 24 at the Samuel J. Friedman Theatre. Ink is set in 1969 London, where the brash young Rupert Murdoch purchases a struggling paper, The Sun, and sets out to make it a must-read smash aimed at destroying the competition. He brings on rogue editor Larry Lamb, who in turn recruits an unlikely team of underdog reporters. Together, they go to every length to achieve success. Graham's New York stage credits include Finding Neverland and Privacy. His extensive résumé of works also includes Quiz, Labour of Love, The Culture, Monster Raving Loony, The Vote, The Angry Brigade, Sons of York and Little Madam. 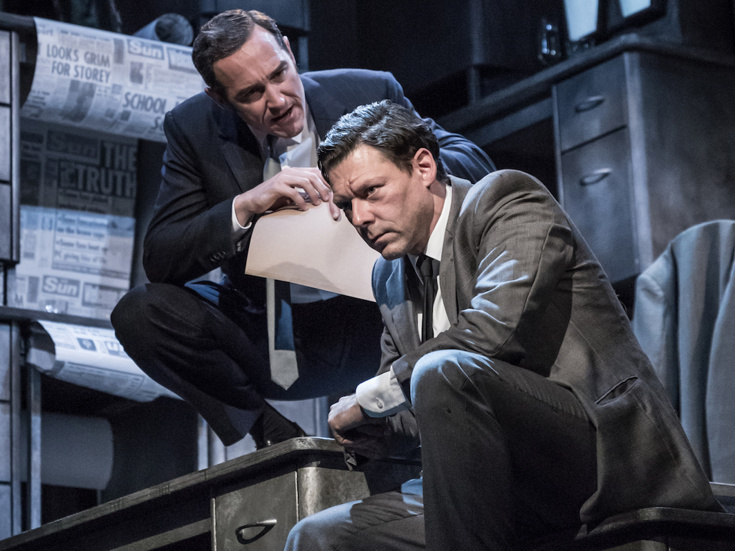 The West End run of Ink starred Tony nominee Bertie Carvel (Matilda) in an Olivier-winning turn as Murdoch alongside Richard Coyle as Larry Lamb. Casting for the Broadway production of Ink will be announced at a later date. James Graham's electrifying and exhilarating new play, based on real events.